Before I move onto the particulars of this, I just have to say that I'm so glad games are still being made for the PSP. As for which in-the-works (and just-announced) PSP game we're talking about in this instance: it's called Bakumatsu Rocker, and it's being developed by the folks at Marvelous AQL. 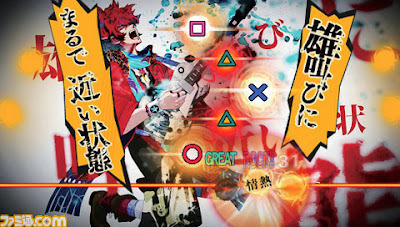 Oh, and as is shared in the header above, Bakumatsu Rocker is a rhythm game set in feudal Japan. "Set in the final days of the Tokugawa Shogunate, the Shogunate is using the 'Heaven’s Song' to brainwash people and rule the country. Freedom fighters are 'rockers' led by Sakamoto Ryoma." Sounds (and looks--based on the screenshots above) great to me. Now someone just needs to start accepting pre-orders for this sucker. Ha ha! Yes :) Why does it not surprise me that you picked up on that? While I do like the fact that there are still PSP games being made, I worry very few well be localized. I know the PS2 had quite a few japanese games being localized after the PS3 and the PS3 well probably be getting plenty after the PS4 is released the PSP hasn't quite been on the same level as success as Sony's home console in the west have but even so I won't give up hope. 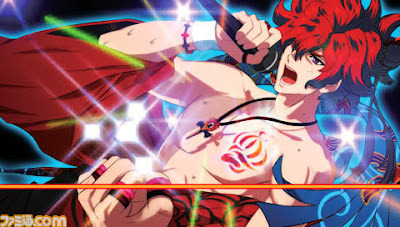 Although I agree with you to an extent, Sam, there have been some recent examples of PSP localizations that should give you at least a little hope--like Class of Heroes 2 and Sweet Fuse. Oh, and Type-0--which may or may not be released outside of Japan at some point. That said, I'm not sure this is the kind of game that will be localized, as it's definitely a bit ... odd. Thanks for bringing this to my attention! It totally looks up my alley... just hope I remember it when it's closer to release. I'm a pretty big fan of music rhythm in general, and I love the look of these screenshots.